Yesterday, we ventured out on a photography expedition for my near-complete book exploring the environmental history of the Manawatu. (See: A racy title is one thing, but what’s the book actually about?) Many adventures awaited us, including an amorous kunekune pig and his similarly friendly ostrich companion, residents of a historic farm at Karere. At Ashhurst, I was unable to resist this landscape – a poignant juxtaposition between old and new. Ashhurst was settled by Europeans from 1877, but this very site on a cliff-top overlooking a place where two major rivers (Pohangina and Manawatu) converge, was the location of an important Rangitane pa, Otangaki (see: Ashhurst wetland: the restoration of the wetland that wasn’t). The gravesite is European, but there are apparently unmarked Maori graves further down towards the river. The windfarm – Te Apiti – was built from 2004, using the biggest turbines ever used in New Zealand. 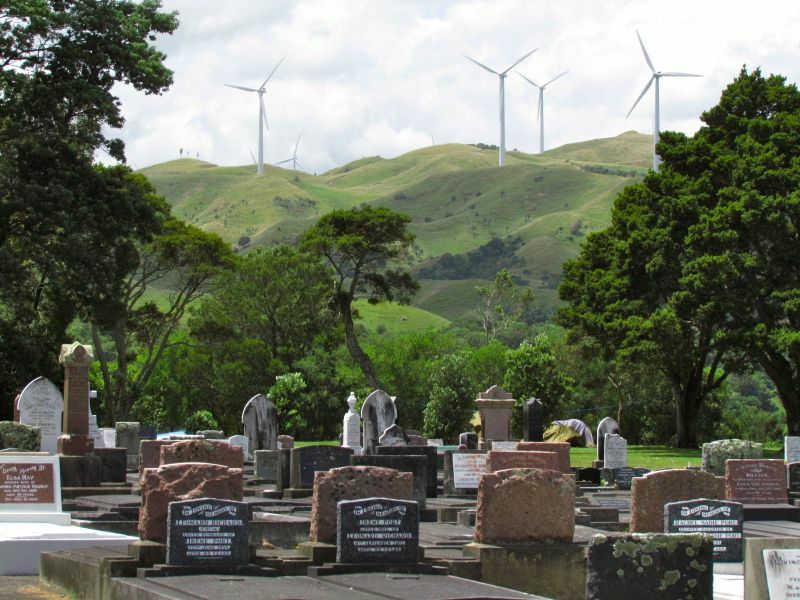 Windfarms have been a defining feature of the Manawatu’s more recent environmental history – both in a physical (landscape) sense and a sociopolitical sense.